"Delicious. The avocado makes the dressing a little creamy, though feel free to leave it out if you wish. Best made the same day you are going to serve it." Bring the brown rice and water to a boil in a saucepan over high heat. Reduce the heat to medium-low, cover, and simmer until the rice is tender and the liquid has been absorbed, 45 to 50 minutes; remove from heat and allow to cool, fluffing occasionally with a fork. Toss the avocado and lemon juice together in a large bowl. 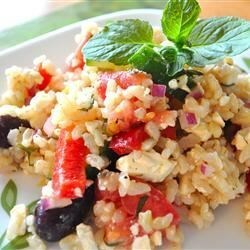 Add the tomatoes, cucumber, onion, feta, olives, mint, olive oil, lemon zest, garlic, salt, and pepper to the bowl; lightly toss the mixture until evenly combined. Fold the cooled rice gently into the mixture. Serve immediately or chill up to 1 hour; the salad does not last well for more than a day as the tomato and cucumber begin to release their juices and the salad becomes watery. Left out the onions....recipe was enjoyed by everyone. I think orzo would be good to use as well....the long grain rice is a bit sticky. Super tasty. Perfect for lunch. I actually added some fried tofu in it, to add some proteins. This was awesome. I did not have any mint and I used green olives instead of kalamata olives. I also added extra avocado because I love it so much. I will definitely be making this again!